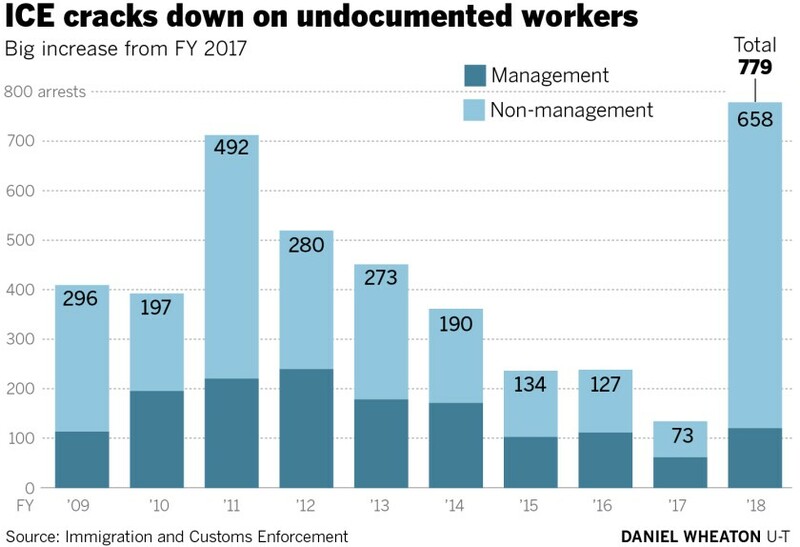 Despite a stated mission of going after employers who hire undocumented workers, Immigration and Customs Enforcement work site enforcement actions, have had greater impacts on the workers, so far in 2019. 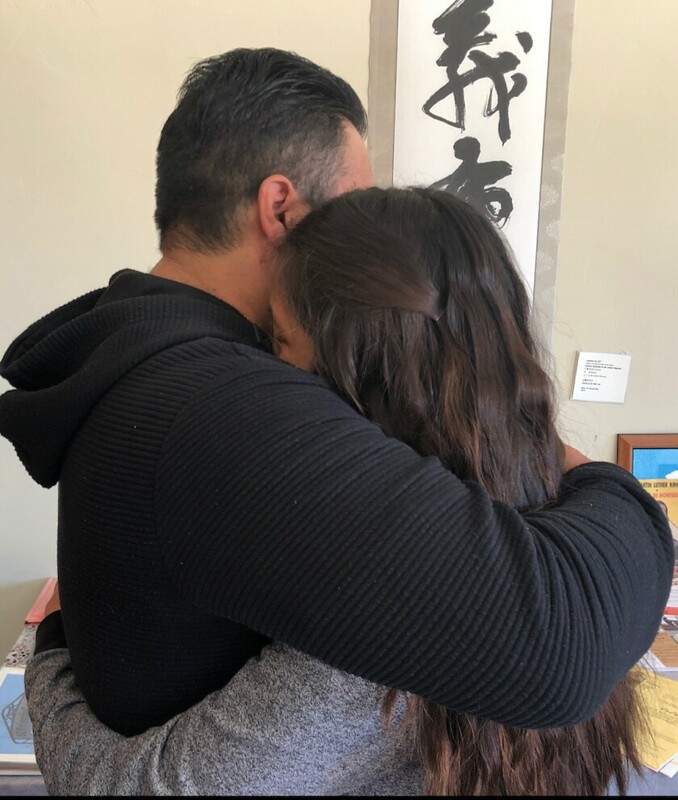 [COLOR=var(--primaryTextColor)]Undocumented worker Victor Coba Alvarez tried consoling his 17-year-old daughter Naidely, outside a news conference announcing Coba’s immigration arrest. She clung to him, sobbing at the thought he may soon be deported. Coba was one of the 26 workers detained during the U.S. Immigration and Customs Enforcement’s execution of a federal search warrant at Kearny Mesa’s Zion Market in February. The agency was ordered to quadruple immigration enforcement at work sites in 2018, a goal it met across the nation, and continued into 2019. However, statistics show the agency met those targets by increasing enforcement against workers much more than against employers. Arrests of members of management doubled between fiscal year 2017 and 2018, while arrests of non-management employees increased by nine-fold, the data shows. Data shows ICE conducted 5,981 work site audits and filed 779 criminal charges nationwide for fiscal year 2018, which ended on Sept. 30. In San Diego, the agency initiated 281 audits in fiscal year 2018 and made 25 arrests. The vast majority of those arrests nationally and in San Diego were of undocumented employees rather than their employers. For fiscal year 2018, the agency arrested 23 workers and two members of management in San Diego. Nationally, 658 workers were criminally charged while 121 members of management faced criminal charges. ICE spokeswoman Lauren Mack said the statistics do not mean the agency is focusing on workers rather than the employers who hire them. She said work site enforcement investigations typically involve in-depth probes, and building a criminal case against an employer is often an lengthy process. “It takes time to build a case. The standards to prove an employer knowingly hired illegal workers are high and often complicated. We need to prove knowledge, which takes time and witnesses,” said Mack. She added that all the criminal cases the agency pursues begin as a regulatory function with a routine I-9 audit. ICE keeps track of two sets of numbers for work site enforcement. One is for criminal arrests, which can include either employers or employees. It also tracks the number of “administrative arrests” which are for less serious immigration violations and typically involve workers, like those detained by ICE in February at Zion Market. Nationwide, the number of administrative arrests of workers climbed 786 percent between 2017 and 2018 - up from 172 to 1,525.
Business records with the California Secretary of State show the Zion Market is owned by Kyu Hwang, a former corporal in the South Korean Army. After arriving in the United States as an immigrant and washing dishes for years, Hwang and his brother spotted a growing demand in the San Diego community for Asian produce and opened the first 2,000-square foot Zion Market on Convoy street in 1979. Hwang is now at the helm of a vast family-run empire that includes six Zion Market Centers across Southern California and one in Georgia; a produce distribution supplier; a company that owns laundry businesses, and a company that imports steel pallets from Mexico, state business records show. Hwang’s nephew, Tim Moon, who manages Zion Market in San Diego, said the business deal to import steel pallets from Mexico was just a venture the family was looking into, but the project was dropped late last year. Moon said he wasn’t sure if he or his uncle is the target of the HSI investigation. He said it could be both of them. Moon said management at Zion Market did not know the workers were undocumented. Hwang could not be reached for comment. Moon said Hwang did not want to comment for this article. On the day the employees were detained at the Zion Market in San Diego, David Shaw, the HSI special agent in charge for San Diego, said it was the culmination of more than a year of investigation. An ICE spokeswoman later said the case dated back to 2011. Court records show Hwang settled a $1.6 million class-action lawsuit in 2017 for unpaid wages brought by an employee of the Zion Market in San Diego. In that lawsuit, a worker alleged Hwang made part of his fortune by not paying workers for missed meal breaks or overtime. Hwang was also involved in a 2011 legal dispute with a former manager over the now-closed Carmel Mountain Ranch Country Club, which Hwang bought in 2007 for $4.5 million. The former manager’s lawsuit alleged Hwang’s son used the country club as a personal ATM, regularly withdrawing money from the business’s general fund. The former manager later asked the court to dismiss the civil case in 2013. In the Zion Market case, the employer is the target of a lengthy criminal investigation by HSI, accoring to Shaw. No charges have been filed yet against either Hwang or Moon. But the case has severely impacted 32 undocumented workers who were previously employed at Zion, said Benjamin Prado, the program coordinator for the US/Mexico Border Program of the American Friends Services Committee. He said so far the consequences of ICE’s criminal investigation have been devastating for the employees. “They’re being processed for deportation. There is an economic impact to the family because they don’t have work and now they have the added expense of needing an immigration attorney,” said Prado. Prado’s organization represents 29 people impacted by the ICE enforcement action at Zion Market in February. ICE agents detained 26 at the Asian market that day. Earlier, they detained three individuals at their own home and three more have since received notices to contact ICE, he said. Prado said concerns about mistreatment of workers may have prompted the attention of authorities, but he said their investigation should not target the victims or include such negative consequences for them. “There is an acknowledgment that many people who are undocumented are being exploited and their labor is being exploited in the workplace ... but we don’t think putting families in immigration proceedings helps anyone in the migrant community,” said Prado. Prado said there are other mechanisms to deal with the exploitation of workers, like through the Department of Labor, and if ICE wanted to help the workers, they would facilitate a manner for them to alter their immigration status. He said his organization is helping arrange legal aid and advice to the group of Zion workers, some of whom have been asked by ICE to become witnesses against Zion Market. Meanwhile, Coba and his two daughters Nancy and Naidely, 19 and 17, have made a lot of adjustments since Coba lost his job at Zion after the raid. Nancy had to pull back on school to look for work to help the family and Naidely has been in therapy. Both have had nightmares about the raid and losing their father. Coba had worked at Zion Market for 12 years. Arrest them and deport the WHOLE family! Stop letting them out on bond to take off and move to another town! Do those idiots actually think we care about them and their sob stories? stoptheinvaders, Beezer and Scott-in-FL like this. 17 year old daughter? Anchor baby? And how MUCH have they bilked the taxpayers out of for childbirth, healthcare, school, free school lunch, welfare and food stamps? How much in IRS tax refunds too for their childcare tax credits? THESE PEOPLE COST US BILLIONS! stoptheinvaders, GeorgiaPeach and Againstallamnesty like this. Not enough raids or consequences. American citizens often face sad situations when accused or convicted of lawbreaking, This includes separation from family. The children should go home with parent/s when ordered deported. Birthright citizenship should not be permitted to a child of illegal aliens. Parents are responsible for placing their children in this predicament. Where are the workplace raids?